A gift for proselytizers everywhere, the Bible Message Camera offers you the perfect opportunity to witness while boring everyone to death with pictures of the dog on vacation. 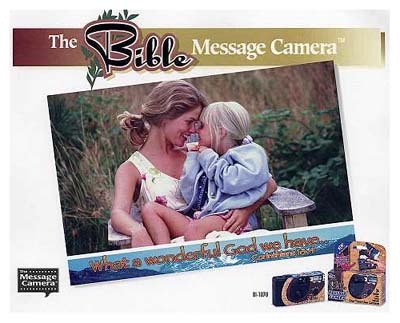 Pre-loaded with 35mm "Special Message Film", this $14.95 camera brands your photos with 24 inspirational verses from the Bible in a unique, clash-with-the-photo-itself style. What better way to accent the memories of the kids' birthday parties than with various non sequitur verses? The camera can be re-used, but be warned: unless you reload with "Special Message Film", the camera will lose its religion. 2009 update: since we posted this gadget in 2006, the Bible Message Camera has unaccountably disappeared from the Internet. Sic gloria transit mundi.